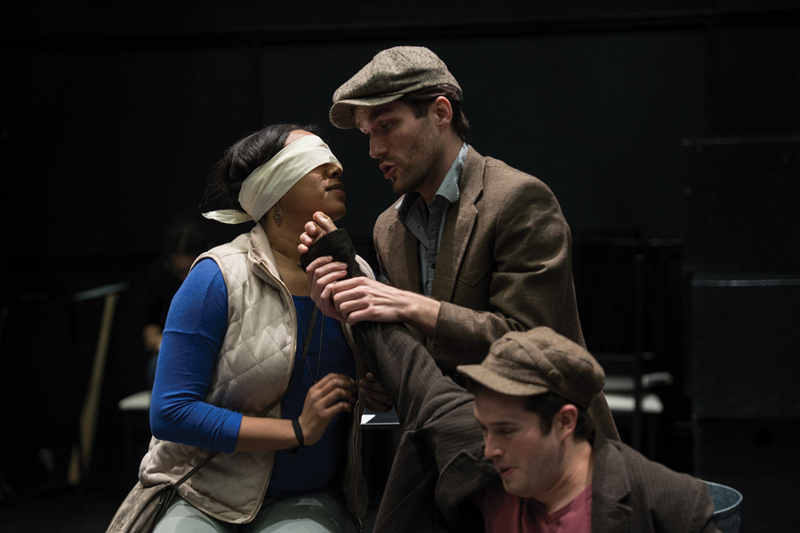 Performers in Northwestern’s “Don Giovanni” rehearse a scene. The production will be set in modern day New York and will incorporate technology and social media. Bienen Prof. Joachim Schamberger has mixed feelings about the use of technology in the modern era. While he reminisces about the days when he could talk to unplugged fellow passengers when riding the train in his native Germany, he also recognizes the merits of phones and social media as a rallying force for large-scale, powerful movements. The #MeToo movement is the backbone of Schamberger’s modernized production of Mozart’s “Don Giovanni.” The opera features a womanizing main character, Don Giovanni, who brags about his conquests and sexually harasses and assaults countless women. The show premiered in 1787, but Schamberger has decided to set the show in modern day New York and make use of social media as a means of commenting on the current political and social climate surrounding sexual harassment and assault, he said. This is Northwestern’s first full production of “Don Giovanni” in its entirety, which will be performed in Cahn Auditorium March 1-4. Schamberger said it will run for about two and a half hours, including intermission, and will be performed in its original Italian with English supertitles. Schamberger said Don Giovanni was a perfect choice for the winter opera for multiple reasons. Not only can it be translated into the modern era, it’s also a classic piece that is technically challenging for the singers. He noted that it’s internationally become more common for operas to be taken out of their original time periods. He said the decision to do this with “Don Giovanni” was easy considering the national attention currently given to sexual harassment and assault that began with the allegations against Harvey Weinstein and other powerful men in Hollywood. The most apparent aspect of the modernization of the show will be the use of cell phones and social media sites such as Facebook and Twitter to help convey events occurring during the show to the audience. For example, Don Giovanni and one of the women he attempts to assault, Donna Anna, meet via a dating app similar to Tinder. The meeting between the two in the opening scene acts as the spark for many of the show’s ensuing conflicts, including Giovanni’s ultimate demise. Bienen second-year master’s student Shallece Peters, who plays Donna Anna, said her character deals with some of the more nuanced themes related to sexual assault, like the concept of consent. Her character, an engaged woman, invites Giovanni into her home in the hope of one last fling before her marriage. While the libretto is unclear as to what happens inside, Peters has chosen to interpret the evening culminating in a sexual assault. Peters also spoke about how the two other main female characters in the opera, Donna Elvira and Zerlina, are able to empower Donna Anna and one another by the end of the show through social media. She said that when Don Giovanni is eventually “taken down,” all three women are on their phones posting #MeToo style messages that will be shown to the audience. Bienen senior Gabrielle Barkidjija, who plays Zerlina, noted that her character is an example of the modern woman. She said after becoming one of Giovanni’s victims, Zerlina works tirelessly to achieve her ultimate goal of exposing Giovanni for the predator that he is. “There’s still gender inequality in the workplace, there’s still old-fashioned ideas of what a woman should do, but I feel like the modern woman is breaking out of those societal norms, and I feel like Zerlina’s character is really trying to do that throughout the entire opera,” Barkidjija said. Eric Olson, a Bienen second-year master’s student who plays Don Giovanni, agreed that the trials faced by the women in the show are starkly similar to what many women are forced to navigate in regards to modern sexual interactions. He said even though the opera is named after Don Giovanni, the women experience the most character development. In comparison to the women finding their strength, Giovanni’s character remains relatively stagnant throughout the production. Olson said that Don Giovanni’s unwillingness to change his lecherous habits is the precise reason why he meets his downfall. Olson also said there is a conversation to be had about society’s obsession with Don Giovanni-esque characters, like Leonardo DiCaprio’s character in “The Wolf of Wall Street.” He said the trope has been so overused that society no longer recognizes the severity of the character’s actions. Schamberger said he is excited for audiences to recognize the piece’s relevance in regards to the opera’s modernization and use of technology. However, while the technical aspects have been fulfilling to work with, he said the most rewarding part of “Don Giovanni” is seeing the students debuting and growing in their roles. Read more stories from the February edition of The Monthly here.